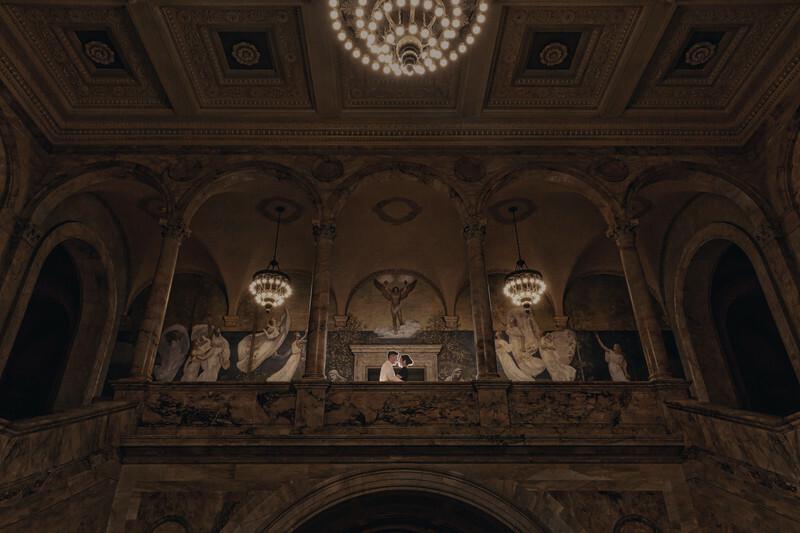 If you google top engagement photo locations in Boston, Boston Public Library will unquestionably appear in the list. At least that's what I found before I flew out there to do Patty and Tyler's engagement shoot. When we started photographing on Saturday, we made the library our first destination on the agenda. And it did not disappoint. As soon as we stepped into the building, we were stunned by the marvelous architecture throughout the whole structure. It is a photographer's heaven (if there weren't as many people). The solemn artwork around the wall depict the rich history of one of the oldest cities in America. We walked around inside the library for a quick self guided tour. Realized there wasn't actually a lot of spots to take pictures with, I positioned the soon-to-be husband and wife in the middle of the way the arch right in the middle of the second floor hallway. And it turned out to be the most epic image. This image took me a while to construct because there were a lot of people walking by. In addition, the distance relative to the couple from my angle was quite far away, I had to pop a flash behind the couple in order to draw the attention to the couple for the viewer. Not to mention, the radio transmitter had some difficulties communicating with my flash receiver considering the radio path was blocked by the railing. Regardless, when I looked at the back of the camera and showed it to the couple, we all could not contain ourselves how bewildering this image was. We were so happy that this destination engagement session got off with a good start! Location: 700 Boylston St, Boston, MA02116.